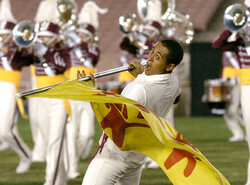 The Cadets have released early details about their 2008 program to be titled "In Pursuit of Happiness." Billed by the corps as "an 11-minute examination of movement, music and the 'secret to life,'" corps director George Hopkins presented the show concept on Dec. 8 in Carneys Point, N.J. to more than 60 returning Cadets members and 170 auditioning hopefuls. Read more about this program at YEA.org.